As I was walking the grounds of this Christian university, I found beautiful crosses to photograph. 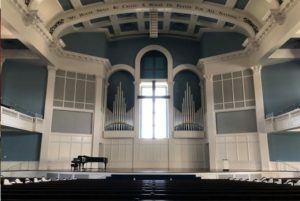 It was a Saturday and I decided to see if the chapel was open. Why not. The front door was unlocked, so I entered. There was another set of doors to enter into the actual sanctuary. The left set of doors were locked. Let me try another. The center doors were locked. Well, let me just check the right set. Keep seeking. As I neared the third set of doors, I see the dead bolt lock extended, resting on the OUTSIDE of the door. Not noticeable from afar. You had to be close to see that the door was not locked. I enter the quiet space, all to my own. Yes, it’s just for me. Having time in a sanctuary, when no one else is around, is special. You get it ALL. Your space. It’s your silence. It’s your peacefulness. Made for you to take in. And I did. 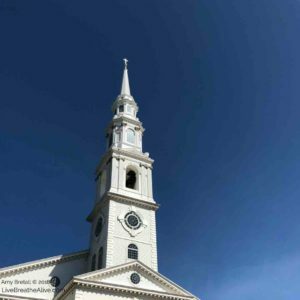 Finding the third set of doors unlocked – isn’t that like faith? Being distant, you can miss out. But embracing the closeness, you get to find unlocked treasures, just for you. Ask, seek, knock is a biblical philosophy I’ve adopted. Seek. I have followed this without even really knowing, just taking photos of crosses. Formed crosses and then unformed crosses. Being open and aware to what is around us every day, I find little treasures. 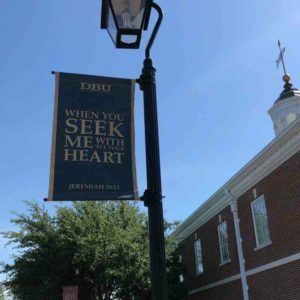 “You will seek me and find me when you seek me with all your heart.” Jeremiah 29:13, has been one of my favorite scriptures, so while walking the grounds here, I was excited to see the words hanging on the banners all around. Yes. Finding the third set of sanctuary doors unlocked is a reminder lesson for me to keep seeking. To draw near.